A New Adventure is Awaiting... in Virginia! This weekend, my cousin Amanda made the big move to Virginia! I am so excited for her and for the opportunity we will have to see her more often. She had a whirlwind of a job offer and in two weeks she found herself moving to Virginia from New Jersey. Today was her first day on the new job so as a surprise, I sent her a handcrafted card as her first official piece of mail in her new home state. 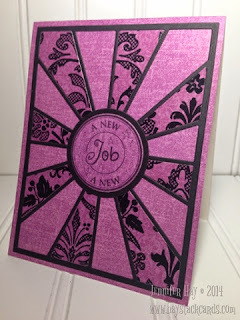 I used the ray of sunshine cutting plate from Taylored Expressions for the card front. Each alternating ray was layered with patterned cardstock from the same coordinating stack in my stash. I added a circular sentiment from Lili of the Valley to the center and matted it on a black cardstock circle in the next size up. I left the card relatively flat for mailing purposes. 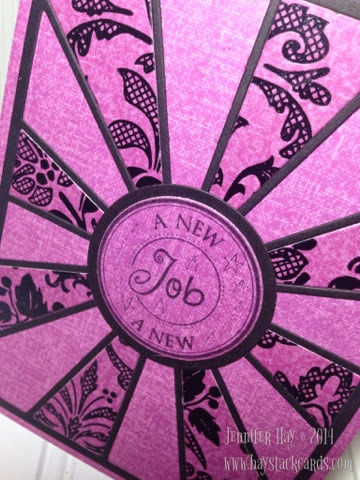 Next time, I would heat emboss the sentiment to match the black shimmer accents on the cardstock. Simple yet elegant!! Have a great day! Wow - that was such a nice surprise for Amanda! You are so wonderful and I am glad she will see you more often (and so will I )!